The boardwalk at Ocean City is an award-winning destination in Maryland. It is home to numerous hotels, restaurants, attractions and covers just under three miles and there is always something exciting happening, making it the perfect place to go if you want all the fun of the seaside with plenty more to do besides. Located at the very southern end of the Boardwalk, Harrison’s is celebrating 30 years as an MD institution and is a very popular choice with locals and visitors. It has enviable views of the inlet and a menu stuffed full of fresh and locally caught fish and shellfish. Thrashers is one of the top rated restaurants in Ocean City MD claiming spot number 2 on TripAdvisor and with good reason. There is no better lunchtime snack than a bucket of French fries from Thrashers. The secret appears to be that they are cooked in peanut oil and although you will often find a queue outside, it tends to move quickly and the fries are worth waiting for. Atlantic Stand first opened on the Boardwalk as an ice cream shop in 1933 but it has since gone on to expand its menu and now offers all kinds of freshly made, delightful options. Popular choices include the hamburgers, the fried chicken and the delicious thick milkshakes. 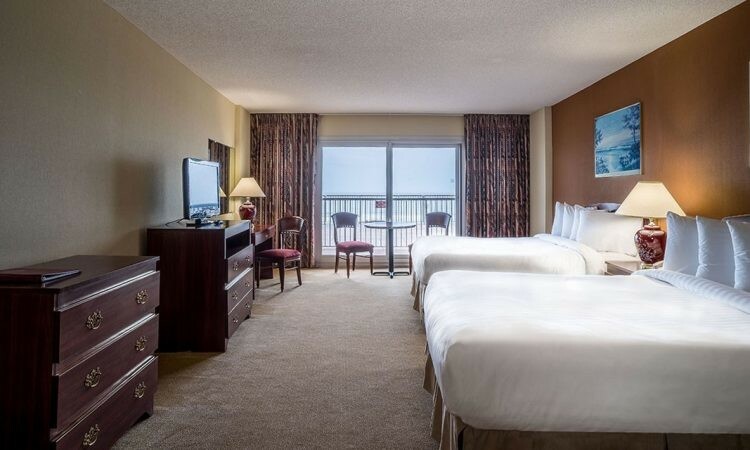 There are also a number of hotels along the Boardwalk which can boast excellent dining options; the Grand Hotel Ocean City for example has six different eateries to choose from including a Pizzeria and a restaurant with views over the Bay. If you need somewhere fairly inexpensive to eat, with outdoor seating because you’ve just wandered up from the sandy beach but you don’t want to compromise on taste or quality, then Boogs is the perfect choice. The cuisine here is American Barbecue and they do it well. Now celebrating its 80th anniversary on the Boardwalk, Fisher’s Popcorn sell a whole variety of popcorn flavors which can be enjoyed by the cup, plastic tub or decorative tin. These flavors include their famous caramel popcorn along with white cheddar popcorn, caramel with peanuts popcorn and caramel chocolate drizzle popcorn. This is a real must for anyone with a sweet tooth. You can’t enjoy a trip to the seaside without enjoying some ice cream and Dumser’s is another Boardwalk institution. You can dine in or choose to take out one of their homemade ice cream products which include milkshakes, sundaes and floats.